Florida State Animal Response Coalition and First Coast No More Homeless Pets would like to offer you an opportunity to take the Awareness Level Small Animal Emergency Sheltering class. When disaster strikes, our team of trained volunteer responders will be there to shelter and protect Florida's companion animals. This Awareness Level (Level 1) class will give you the knowledge and skills you need to work in an emergency animal shelter or pet friendly shelter. It will give you the expertise and practical experience required to become a professional disaster animal responder. 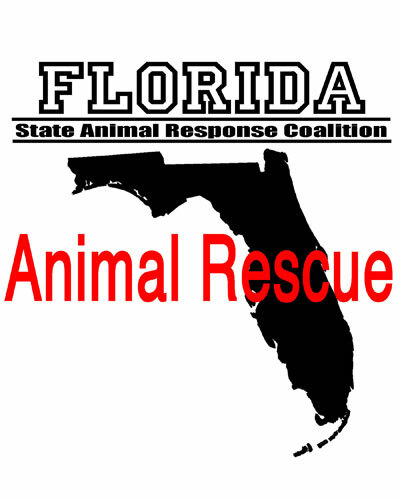 The Awareness Level Small Animal Emergency Sheltering class is certified by the Florida Department of Emergency Management and is required to respond in Florida to help companion animals during a disaster. There is a $15 administration fee for each participant. After successful completion of this class you will recieve a complimentary Florida SARC uniform t-shirt. Choose your shirt size on the registration page. You may also order additional shirts for $15 each on the registration page. The animals in Florida need you when disaster strikes. Space is limited! Click on the link below to register now.